Japanese culture has embraced Christmas in a wide, superficial way. Stores are decorated with ornaments, cookies, etc. and Christmas music is played in most places. More than a few homes also have Christmas lights. I don’t think they celebrate exactly as we do. The day itself is not a national holiday which started this Saturday with the New Years celebrations. This is a big break for a hard working culture and most people are on vacation and traveling. As with Halloween, they enjoy the secular aspects of the holiday. 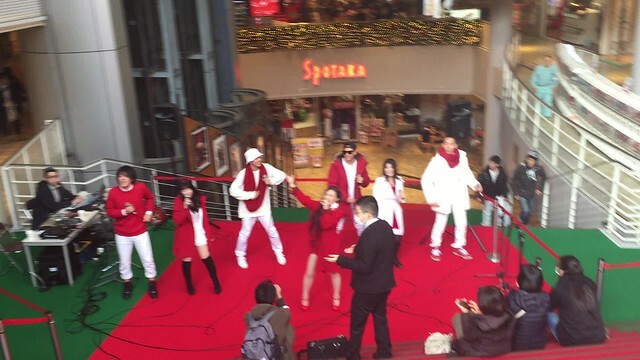 I took the video above at a mall in Amerika-mura (American village) section of downtown Osaka on Christmas Eve. A peculiar aspect of Christmas here is that it has become associated with eating chicken, especially KFC (Kentucky Fried Chicken). I read where it was a successful advertising campaign that started many people eating chicken on Christmas. It also has kind of a romantic feel about here as well, with couples going out for the evening. I saw quite a few santa outfits on people in the street downtown.